Sea level pressure: 1012.7 mb. 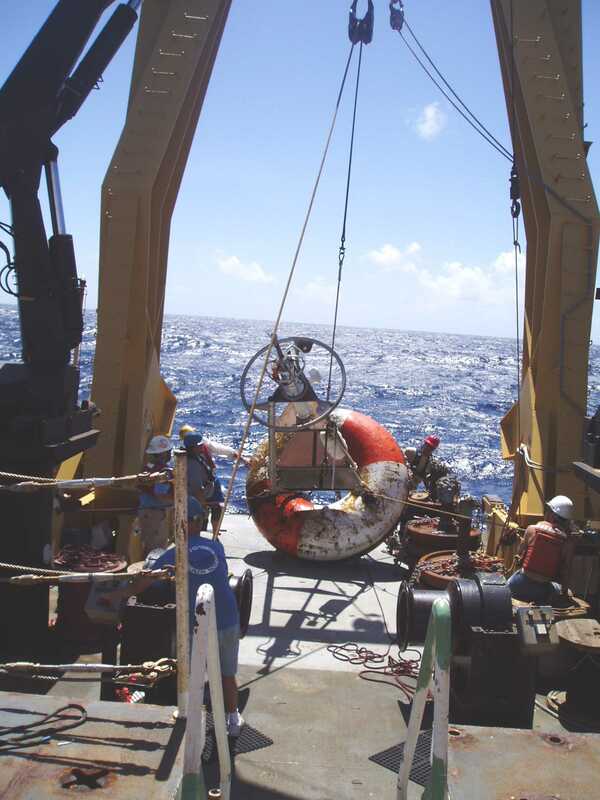 The primary mission of the KA’IMIMOANA is to service and maintain the TAO/Triton array of weather buoys strung out along the equatorial Pacific Ocean. TAO stands for Tropical Atmosphere Ocean and Triton is the name of the Japanese component of the array. These buoys are jointly maintained by Japan and the U.S. in an effort to better understand how the oceans affect climate and weather, especially in the regions close to the Equator. Today I was able to observe first hand the entire operation of retrieving and deploying what used to be called the Atlas buoy. They are now designated as TAO buoys. These buoys are placed at strategic points north, south and on the Equator. The first leg of this mission began in Honolulu on August 21, 2003. Honolulu is the home base port for the KA’IMIMOANA, which I hope you all know means “ocean seeker” in Hawaiian. 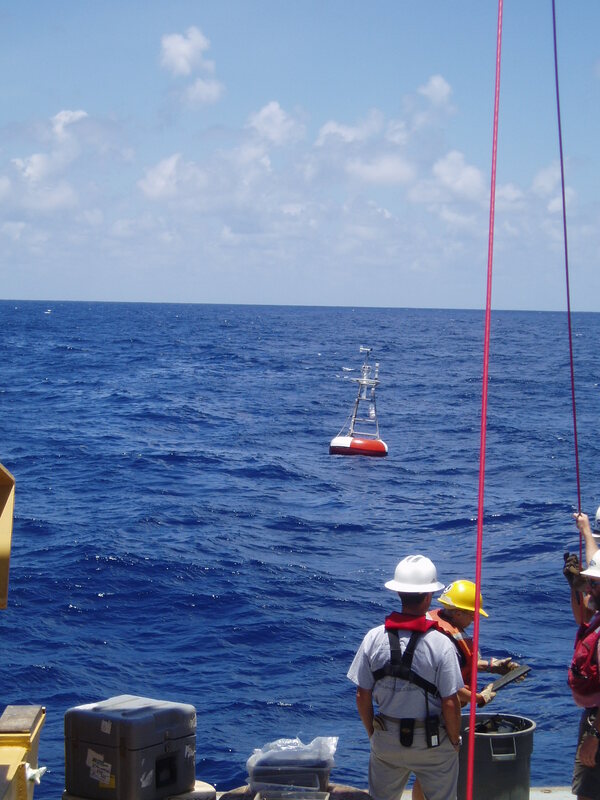 TAO buoys are jointly maintained by Japan and the U.S. in an effort to better understand how the oceans affect climate and weather, especially in the regions close to the Equator. Tetsuro Isono from JAMSTEC (Japan Marine Science and Technology Center) was on board as part of the Teacher at Sea program for the first leg from Honolulu to Nuku Hiva. You can access his broadcasts on the NOAA Teacher at Sea website. Although he was speaking Japanese, an English translation can be printed out for you to follow. In his broadcasts, Tetsuro interviews many of the scientists on board and introduces much of the equipment and buoys that are used in this project. It would be very helpful for you to view these broadcasts in order to get a working background for the buoys and their operations, but I will also be giving explanations during the project. The first thing in retrieving the buoy is that is that it is sighted from the bridge of the ship. These are moored buoys, so they remain in position where they are placed. Once the buoy is sighted, the RHIB (Rigid Hull Inflatable Boat) is lowered from the ship, and a crew is sent out to visually inspect and to remove some of the instruments that would be damaged during the retrieval process. The anemometer, rain gauge, and Patrick Ahearn, the Chief Scientist and one other “volunteer”. The buoys are usually very slimy and slippery having been out in the ocean for a period of several months, so climbing on the buoy can be a dangerous affair, especially if there are significant waves and swells. One of my students has asked the question: “What information is gathered by the buoys?” The buoys gather data constantly on the following: wind speed and direction, air temperature, relative humidity, rainfall, downwelling shortwave radiation, downwelling longwave radiation, barometric pressure, sea surface and subsurface temperature, salinity, water pressure, and ocean currents. You can find more details about the instruments for measuring these variables at this website: http:www.pmel.noaa.gov/tao/proj_over/sensors.shtml. The data is transmitted via NOAA polar satellites and is actually picked up by computers located on Wallops Island. This information is used by scientists all over the world who are studying the Pacific Ocean and its relationship to weather and climate, particularly the El Nino and its opposite La Nina. I will be talking more about these as the cruise progresses. After the buoy was retrieved, a replacement buoy was deployed. I will be posting pictures on the website of the marine life growing on the bottom of the buoy, and it must be cleaned, painted and otherwise serviced before it is used again. The process of retrieving and deploying a new buoy takes approximately 8 hours, as many meters of cable must be spooled on board, and it is amazing to watch this crew work together to bring it all off. It is a well orchestrated event that I will do more to explain as we go along. The retrieved buoy must be cleaned, painted and otherwise serviced before it can be used again. Today was a full day indeed for me, and thankfully I was over my initial seasickness. The opening act of the morning was my first ride in the RHIB to go out to the buoy. You can see from the weather observations that it was by no means calm seas, so the ride out to the buoy was pretty exciting. I was then put to work helping to spool the Nilspin cable which attaches the mooring to the buoy. The spooling operation takes a long time, and even the XO (Executive Officer) joins in to help. I observed the entire retrieval and deployment operation, and it basically took the whole day. After dinner, I began training with Randy Ramey, the Survey Technician in charge of the CTD’s. I was actually involved in every aspect of the operation under Randy’s expert guidance and Tom Nolan, the scientist from NASA was also on hand. I will save an explanation of the CTD for another day, but this instrument is really fascinating to me. TAS Nancy Lewis helps spool the Nilspin cable which attaches the mooring to the buoy. Nancy trains to control the CTD (Conductivity, Temperature, Depth) probe deployment. It has been a long and exciting day, but very satisfying. I am still learning my way around the ship and getting used to the shipboard schedule I would like to invite anyone who is looking at the website to e-mail your questions to me, which I can include the answer to on my daily logs. Before I close, let me pose a question for you: What is the Doppler effect? My thanks go out to my colleagues and students at Na’alehu Elementary and Intermediate School for helping to make this project a success, and I wish you all a fond Aloha! 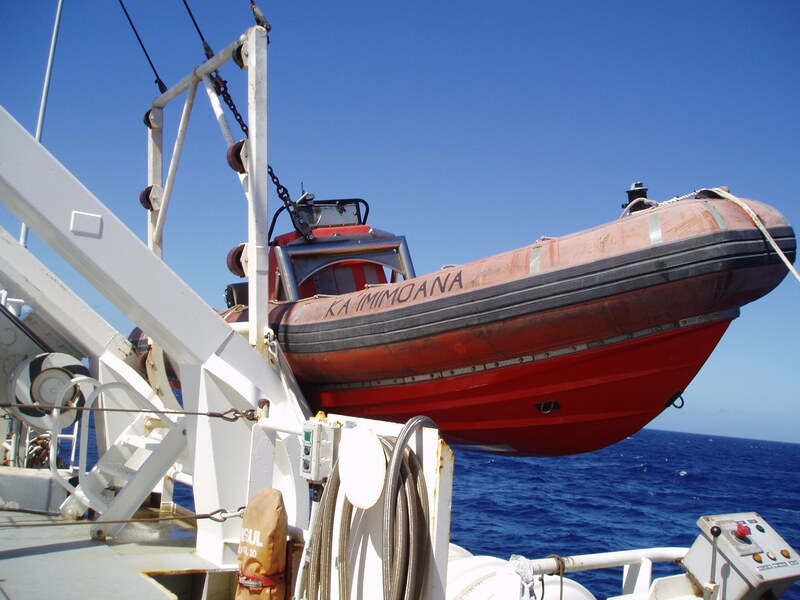 This entry was posted in 2003, Nancy Lewis, NOAA Teacher at Sea and tagged buoy, noaa ship ka'imimoana, rigid hull inflatable boat, TAO/TRITON, Tropical Atmosphere Ocean. Bookmark the permalink.